Brand Workshop — Trischler Design Co.
You have to know who you are before you can communicate that message to others. Too often organizations run aimlessly, tripping over seemingly insignificant details, or they are brimming with ideas and energy that never quite get off the ground. Either way, it's frustrating, and you never reach your potential. The Brand Strategy Workshop will help your business or organization feel less chaotic and more connected to its core purpose. 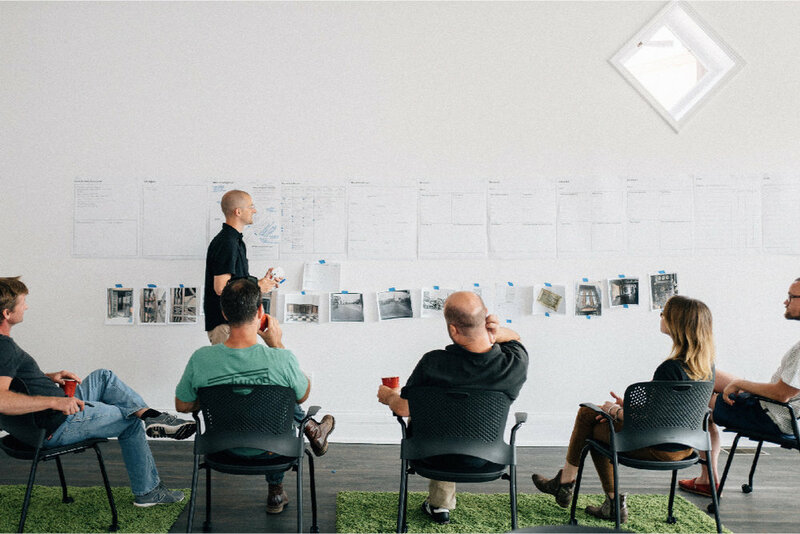 Though a collaborative discussion we'll uncover your Big Idea, understand your audience, set goals, and more. Already clear on your Big Idea? Brand Identity Design can give you a full set of tools to share it, and Website Design can help you connect it with your audience. The workshop is a lot like mining for gold. It's difficult work, and the things we discover will appear rough and unpolished at first. But then we’ll refine the raw information we collect into these immensely value elements. The Big Idea is one to five words that sum up your core purpose. These words influence the direction for future visual and verbal brand identity, design, marketing, and strategy. The brand statement is an elevator pitch of sorts that cohesively communicates your product or service, target audience, culture, voice, and desired impact. Creativity and inspiration come from surprising places. Together we’ll analyze examples of case studies from outside of your field/expertise that can influence your future strategies. What are other organizations doing that we should be mindful of? Who is working in your field regionally, nationally, and internationally? What do they look like and how do they sound? How does your business or organization fit in—and how do you stand out? These questions help determine your purpose, mission, and values and shape how you express who you are and what you do. We identify the archetypes of the people you’re aiming to interact with—a representation of the accumulated stories and needs each part of your audience. Often, we’ll interview project stakeholders and customers or donors before or after the workshop to get their direct perspective. Now we’ll look ahead to how this new, deeper understanding will transform how you think and act as an organization. What are your goals for increased revenue, transparent communication, and increased efficiency? These goals will define and clarify the short-, mid-, and long-term strategy. Brand mandates are values and intentions that are central to your identity—and your success. They are overarching principles that guide choices about your look, voice, and interactions with your audience. There’s really no incorrect way to implement the findings. At the end of the workshop, you'll be refreshed and energized, brimming with renewed passion and new ideas. And once you have the full workshop results in hand, you'll have the tools you need to begin finding ways to use your brand's voice to communicate with your audience. After the workshop, many organizations pursue a complete brand identity and then a website to connect their Big Idea to their audience. Your sample group—handpicked from colleagues, friends, customers, donors, coworkers, family, mentors, coaches, or anyone willing to share a thoughtful perspective on your organization. Preferably on a business work day. Mornings are best—that’s when people are usually the sharpest. After the workshop, we’ll compile and present the full results in 2 weeks. The cost of the seminar includes a facilitator, co-facilitator, and pre- and post-workshop research and analysis. The price depends on your needs and the size and complexity of your organization, but most workshops start at $3,000.